"Music for a Summer's Evening"
"Ghost Whispers in the Dark"
East Staffordshire Borough Council has announced the results of the parish poll held in Rolleston on Dove on Thursday, December 20th, following a request from residents for a vote on the EU Constitutional Treaty. The question asked was ‘Do you want a referendum on the current EU Constitutional Treaty?’ The results were 254 votes for Yes and eight for No. The vote had a 9.92% turnout with 262 Ballot Papers issued from an electorate of 2642. The poll was held at the Scout HQ, Station Road, Rolleston on Dove, between 4pm and 9pm. Parish polls provide an opportunity for local electors to express an opinion on a specific subject. The Local Government Act 1972 and the Parish and Community Meetings (Polls) Rules 1987 give electors the right to request a parish poll. More than ten electors have to back the call and the request has to be made at a parish meeting. A formal request for a parish poll was made at a Rolleston on Dove Parish Meeting on November 19th, 2007. It was hoped the associated (controversial) £600 cost would be met by donations. Pictures of some of the many angels (did anyone count them all?) appear here. The whole event raised over £3,100 for the Fabric Fund! November has seen the regrettable demise of another historical association with the village. In the Summer issue of Rollestonian an appeal was published for new members to the Society and support for the Committee. Unfortunately none was forthcoming and the ageing membership felt that it had no alternative but to wind up the Society after its original formation 165 years ago. The Burton Natural History Society was formed in 1842 when it opened a museum in High Street, Burton. The opening ceremony was performed by Sir Oswald Mosley and the Mosley family continued with strong support throughout the 19th and early 20th centuries. The museum was housed for a period in the grounds of Rolleston Hall and the original records of the Society were destroyed in the Hall fire of 1871. The residual assets of the Society have been divided equally between the Staffordshire Wildlife Trust and the Claymills Pumping Engine Trust. On Sunday 11 November Burton Conservation Volunteers were working in the Spinney clearing and planting up an area for Hazel coppice, that will enhance the Biodiversity of the area and provide natural materials for future projects. Four caring ladies organised a special event in Rolleston Club on Friday 28 September as part of the Macmillan Cancer Support's "World's Biggest Coffee Morning". Phyllis Rice, Jessica Walker, Pat Edwards and Linda Dicken ran a raffle, a tombola and a book-stall, as well as serving coffee and home-made cakes. This has become an annual event and, once more, was well supported by the villagers. 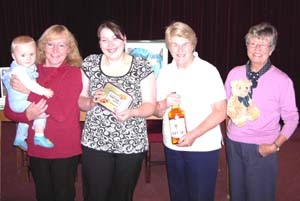 The picture shows (left to right) Phyllis (holding baby James Lester), Jessica, Pat and Linda in front of the tombola stall. Rolleston Choral Society's latest production, "Music for a Summer's Evening", was a great success. An enthusiastic audience filled the Scout Headquarters for a new style of performance for the Society. The music covered a wide range of styles and geographical origins, from a solo by James Taylor to full chorus, from Billy Bragg to Ralph Vaughan Williams, from America to KwaZulu-Natal. The accompanist was Nicholas Waller. The programme was varied by the inclusion of an English folk tale, "The Buried Moon", read by Allan Lloyd, and fiddle music from Patsy Starbuck and friends. The new Musical Director of the Choral Society is Simon Lesley (pictured), a lecturer at UCE Birmingham Conservatoire and South Birmingham College. Simon, who as a boy won the Dean's Chorister award from Chichester Cathedral, is extremely versatile, as well as talented. 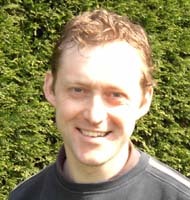 He is also a widely-published composer-arranger, as well as a performer who has played solo trombone for the Staffordshire Band. He has played in the Cheltenham and London International Jazz Festivals, and worked with the Swingle Singers. He has played the organ in Bristol Cathedral and conducted services in Worcester Cathedral. The next concert will be in St Mary's Church on Saturday 15th September, as part of Rolleston's Heritage Weekend. Bob and Win Essery’s garden – ‘Greenridge’, Anslow Lane – has been a frequent entry to both the Brighter Borough Competition and also St Mary’s “Gardens Sunday”. This year they have been awarded a Silver Gilt Medal for their front garden and a Gold medal for the back. Unfortunately Bob and Win are leaving the district but also leaving a well-maintained garden and challenge for whoever moves in! Congratulations to them and also to Mr & Mrs Clarke of 59, Meadow View for a Gold Medal for their back garden. Rolleston’s sister church, Holy Trinity at Anslow, also received a Bronze Medal for best maintained grounds at a place of worship. Following an application for the Jinny Nature Trail to become a Public Bridleway between Dovecliff Road, Rolleston on Dove and Bitham Lane, Stretton, a Public Inquiry was held on Wednesday 11th April and Thursday 12th April 2007. A number of representations were made at the inquiry both for and against the proposed bridleway, and Rolleston and Stretton Parish Councils jointly appointed a barrister to present the case of the Parish Councils. It was announced, some months later, that the application had been refused, and the Jinny Nature Trail will therefore remain as intended, a nature trail. Despite torrential downpours on the days leading up to Gardens Sunday on 17 June, the afternoon itself was thankfully dry. The event featured 12 gardens open to the public, 5 of which were new to the event. There was music from the Fiddle Folk and a local Hurdy-Gurdy man as well as organ music in church throughout the afternoon played by a number of local organists. 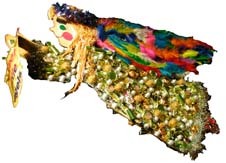 There was a competition for children to look for fairies hidden in the gardens. Visitors also had the opportunity to see the Old Grammar School, which has recently been refurbished with the aid of money raised from previous Gardens Sundays in addition to grants from East Staffs and BIFFA. 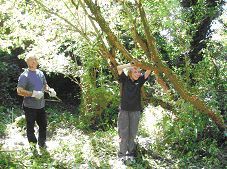 Hopefully a large amount of money will have been raised in aid of St Mary’s church ACCESS fund, on what might be (for a while at least) the last Gardens Sunday to be held in Rolleston. On 9 June thousands of fun-seekers braved the sun to enjoy a fun packed event. Organised by FOJORPS the event is expected to raise several thousand pounds for school funds. An evening of flickering lights, shadows and tombs in the corners of St Mary's church provided an eerie setting for an excellent performance of storytelling, by international star Cat Weatherill, who combined words with live music on her dulcimer to wonderful effect. Within seconds the audience - especially near the front had almost jumped out of their pews!! The half time interval was an opportunity to grab a drink and biscuits, catch up on village gossip, and prepare oneself for some more thrills and chills! Some braved the walk home - whilst I for one was glad to get back in my car. Maybe Rolleston has more inhabitants than we thought? The event held on 25 May was promoted by "Live & Local", an organisation dedicated to bringing nationally and internationally important performers into small venues in rural communities, and subsidised by the Arts Council, Staffordshire County Council and ESBC. On 17 May Rodney Paul and Mark Jordan set off on a cycle ride from Lands End to John O’Groats. Rodney was raising money for computer equipment for the Old Grammar School Room; Mark was raising money for the Burton branch of the Alzheimer charity. Read about their adventure here. Marek Trelinski, 24 years on the Parish Council and 20 years as a Borough Councillor. Wally Hodson-Walker, 20 years on the Parish Council and also in the past, 12 years as a Borough Councillor and 4 years as a County Councillor. John Westwood, 8 years as a Parish Councillor and Andy Starbuck, 4 years as a Parish Councillor. A hard act to follow! Unfortunately the unusually warm and dry weather in April didn't last into May. Not sure if it was the wettest carnival in recent years but hope if you did brave the rain you had a good time. Highfield Motor Company which began trading in 1972 - moving to Rolleston on Dove in December 1973 - is closing it's village site. Whether or not you ever bought a car from there the loss of a local friendly petrol service (in April 2007) will be felt by many. 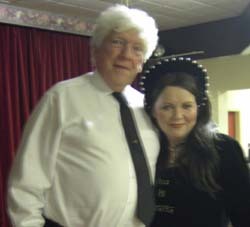 The latest event organised by the Rolleston on Dove Special Events Committee (RODSEC) was an Evening with Anne Boleyn, performed by Lesley Smith of Tutbury Castle, in Rolleston Club - held on Sunday 25 March. There was a capacity audience of 180, and tickets had sold out three weeks before the event. Lesley had previously appeared in Rolleston as Mary, Queen of Scots, "Gloriana" and Nell Gwyn. This new performance was, as she put it, "darker in tone" for the first half hour, as she was depicting Anne's last hour of life before her execution. The hall was dimly lit and the tragic Queen was dramatically illuminated by candles on a small table. The lights were then put on again and Lesley launched into her usual happy, bubbly and entertaining mixture of historical fact and amusing anecdote. After the performance, there was a savoury buffet prepared by Beryl Toon, followed by a choice of thirty different home-made puddings, provided by Verity Conner and friends. Tom and Sylvia Martin ran a well-supported raffle. That the evening was a financial as well as a social success was due in part to a generous grant from the Burton and District Arts council (BADAC). This covered most of Lesley's fee and enabled RODSEC to keep the ticket price down to £5, including the buffet. All proceeds from the evening will go towards the Heritage Weekend to be held in the village from 14th to 17th September. The picture shows Lesley Smith with the new RODSEC Chairman, Arnold Burston. On World Book Day (Thursday 1st March), four groups of children from John of Rolleston Primary School came to the Travelling Library to help staff recycle old picture books and transform them into badges. Once the children had selected their favourite illustrations the library staff on board helped with the cutting out and badge stamping. Sarah Ward from East Staffs Borough Council entertained the children with colouring activities as part of her Recycling Road Show, The end results were later taken back to school. John Morris, the local hurdy-gurdy man, brought a festive atmosphere to the day with his musical organ box - always a popular attraction at Rolleston. Many thanks to him for standing out in the cold wind all morning! The library was buzzing throughout the day with 60 enthusiastic children dressed as book characters. Several princesses, Harry Potters and Star Wars characters joined in the activities and explored the children’s books on board. In addition, the local Travelling Police Station parked alongside the library for most of the day so there was a real community atmosphere. A very happy World Book day was had by all thanks to everyone who contributed. Don’t forget Rolleston Library parks on Rolleston Club car park every Thursday from 9.30 am – 7.30 pm.